Even acupuncture can help to alleviate the pain and discomfort of arthritis. This centuries-old practice involves the placement of fine needles to restore the body's flow of energy (Qi) and stimulate its self-healing mechanism. When performed by a licensed acupuncturist, it can strengthen the joints and ward off arthritis. Osteoarthritis is the most common form of Arthritis among adults and affects joints in the hands, lower back and neck, causing great discomfort and reduced mobility for millions. A large meta-analysis consisting of 12 trials and 1,763 patients with osteoarthritis has revealed acupuncture to be an effective way of treating arthritis pain, rivaling conventional medicine. 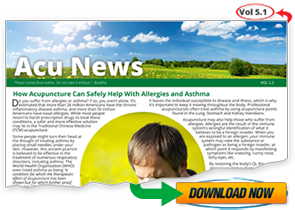 Researchers also said that electro-acupuncture would likely increase the effectiveness of acupuncture but it was excluded from the meta-analysis to rule out electrical stimulation as a variable. Not only was acupuncture found to be an effective way of treating osteoarthritis but is also a safe and natural way to treat the ailment. If you suffer form arthritis then you should consult and acupuncturist about treatment for your symptoms as it can greatly improve your quality of life.